Wanna See Things Change? Pray. Is it a request that we send up to God when we need His help? Is it a quick thank you for an answered one? Is it a duty before we take communion or a bite of lunch? I will be doing a series of devotions on prayer over the next couple of weeks and as I learn more about it, I want to share that with you. I also want each devotion to have a challenge for the day so that we can begin getting into a daily routine of prayer and quiet time and learn to go beyond the simple requests and thank yous. I want the daily challenge to be something we focus on together and know that others who read these devotions are praying together in their respective locations. There’s nothing like troubled times to bring us to our knees in prayer, and I know over the last year there have been a lot of things in my life to pray for and I’m sure the same with you. If we just start with the issues in our world, country, state, city, school and workplace, we would have plenty of prayers for years. But I want us to get deeper with prayer. *Acknowledge and praise the Father in heaven. He is the all-knowing, all-present, Only God. *Ask His will to be done. Not our will. But His will. *Give us basic needs for the day physically as well as spiritually. *Forgive us for all the sins we commit outwardly and inwardly. *Help us to also forgive those who have sinned against us. *Help us not to be drawn in by the devil’s schemes and give into temptation. *Keep us away from satan. I know there are many more avenues for prayer but just for today and the next couple days, let us really focus on just these things when we pray. Acknowledge how powerful God is and that we believe He is the Only One. Pray for His will in all situations. Thank Him for our daily food and needs being met and ask for spiritual growth. Ask for forgiveness of our sins and then forgive someone you need to forgive. And pray for guidance to not give in to temptations put in front of us. CHALLENGE: Using the Lord’s prayer as our model, pray those 5 things above and customize them specifically for you. Dig deeper than reciting the prayer. Actually make it for your specific needs. We can do this. This journey through prayer will change us. I know it’s changed me and I hope you will join me on this adventure to see how God will show up and change our lives in a mighty way. I’m so excited to get started! 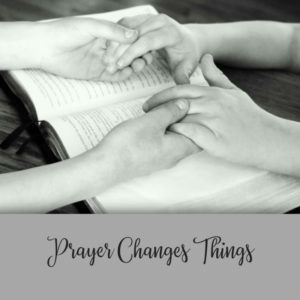 This entry was posted on August 10, 2018 with tags: #prayerchallenge by Deanna Young.